Austin Miller dreams ten impossible things before lunch. Just kidding, but he does write about fantastical worlds and loves to challenge the minds of his readers. Austin Miller. During the day I'm Head of Marketing at a virtual reality startup and at night I'm a father and a creative. That means I juggle my illustration and writing work while hanging out with a 2 year old. Luckily, she's a really really cute 2 year old. What was the inspiration for your first book? My first book Journey to Wasteland explores the tangible effects intangible ideas or beliefs can have on our lives. Alan Moore explains this in an interview when he describes magic not as casting spells, but as the physical realization of ideas. What was the process like to publish it? Journey to Wasteland I published myself. I created a campaign on Kickstarter and got enough money to hire an editor and cover designer. 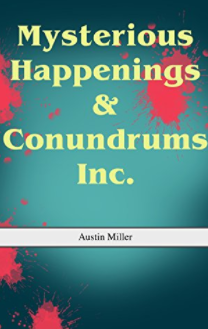 My second novel, Mysterious Happenings & Conundrums Inc. was done in conjunction with a studio that did the narration. It's an e-book, but it's also an audiobook. I write in sprints. I wish I could be consistent, but it just doesn't happen that way. Most of my writing happens on the couch watching Netflix with my wife and kid. I try and write it all down, and go through the refining process later. You'll never finish a book if you constantly edit as you go. I think it's best to segment! JK Rowling, Anthony Bourdain, Tolkien, Hunter S. Thompson. Ernest Cline, Lewis Carroll, John Knowles, and Miguel deCervantes. How do you get over writer's block? I've got two projects going on simultaneously, one is a dystopian sci-fi adventure that involves a team of academics hunting for archeological finds. The other is a children's book that uses my own illustrations. This time I'd like to go the traditional publishing route--I think especially with the children's book. Picture books and comics are so much better when you can hold them! What's the best writing conference or retreat you've been to? If you were stranded on an island what five things would you want with you? A surfboard to catch all of those gnarly waves. A kindle with a solar charger and all of my books loaded on it. If you could have coffee with any author who would it be? First off, I'd be drinking a Yerba Maté :). Secondly, my author choice would have to be someone that not only produces interesting works but is an interesting character themselves. Assuming the question applies to both past and present, I would probably choose Shakespeare or Jim Morrison. Quite the contrast right? But hey, it's who I find most interesting! If you could have a super power what would it be? Probably pure speed. That way I could fulfill my other fantasy of being a Premier League soccer player! What is your favorite genre to write? Fantasy, but not epic. I like character driven stories with quirky characters. I also like to mix in a lot of philosophy and humor. If one fantasy world could be real what would it be? I'd have to say the Harry Potter universe. That way you still get all of the muggle comforts, but with all of the magical charm.